Mommy's Best Games, Inc. is an independent game developer founded in 2007. Our seventh game, currently in development, is Pig Eat Ball on which we started working in 2013. This is behind the scenes thoughts about game development and marketing. Hello, Amy here. As the marketing and business side of Mommy’s Best Games, I decided to write this week's entry. Plus, as we shoot for the November 19th launch of Community Games, Nathan has his hands and head full of many other important tasks. As you have read in prior devlog entries, we entered Weapon of Choice into Microsoft’s XNA Dream Build Play 2008 international competition. We were very excited to learn that we earned THIRD PLACE!!!! We are the top American team. Check out the other winners; they all look great and are fun. It is definitely worth your time to check out. We were also invited by Microsoft’s XNA Team to attend the Xbox LIVE Community Games and XNA Game Studio 3.0 Launch Event in San Francisco on October 29th. What an event! Also in attendance were the Word Soup and Colosseum teams. 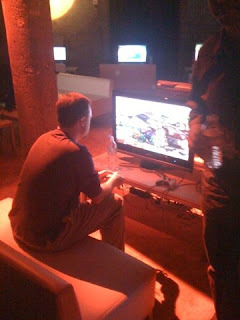 The room was set up with more than 15 high-def flat screen TVs with ready-to-play Dream Build Play and other XNA games. The press came, and we were ready. Although it was tough in one week to pull off schwag, we rocked it! Through Ebay, I ordered 50 1GB flash drives to create digital press kits. Although we would have desired to have our logo imprinted, it would have taken too long to print, ship and save data before the event. Instead, I created a sticker that had the WoC logo and Mommy’s Best website. The digital press kit included a welcome letter, two game trailers, three tracks of original music composed for WoC, screenshots and concept art, Mommy’s Best and WoC logos, unique gameplay features document, pertinent websites, and a partridge in a pear tree. We also ordered flexible flyers with the WoC title screen imprinted on it, in black, which were tossed around the party by the end of the night. Again, the lesson learned was, 4-color imprint is what is desired; it is expensive, especially when you have a rush order on it. We also provided the community and press with our promotional game cards, game card magnets, and business cards. The trick to getting all of this together so fast really relied upon 3 day shipping straight to the hotel instead of trying to get it here first, then take it with us to the hotel. Nathan and I were very excited to talk with journalists from Gamasutra, MTV, WIRED, Gamespot, IGN, Joystiq, and Destructoid. Heck- we even have a piece in the New York Times. The press we have already received has been phenomenal. However, we will still not abandon our original marketing plan: 1) get on as many blogs and websites as possible, 2) get friends and fans to deliver game cards to local game stores, college bulletin boards and any place that gamers frequent. Although, Microsoft's hospitality sure did help boost Weapon of Choice's marketing plan. So, as high as we feel, onward we go, to finish Mommy's Best Weapon of Choice by November 19th. My weakest area is in sound design and creation. I always dread having to make sound effects for the game. I end up enjoying it sort of like exercising, though it's tough to get the motivation to start. I like to think positively that it's the easiest area for me to improve in when working with sound effects. Fortunately Hamdija is handling all the music and doing a real bang-up job. I would love to have someone (other than me) recording each sound effect from nature, or blending natural sounds to get a new sound. Unfortunately, I don't have the time or the budget or the equipment to record each sound effect in Weapon of Choice. I honestly think the sound design is coming along at least satisfactorily, and sometimes really well. Since I'm not recording the sounds, that means I have to get samples from somewhere. When I first started in the industry over a decade ago, RWS was using 'the General' for sound effects. I think that still stands as a very good option, but since then I've worked for wealthier studios which employ sound designers in-house who often record new, unique sounds for each effect. MBG has neither of those options. While $1500 isn't a fortune for the General, it is enough to force us to consider other options. One of those options I've found while looking turned out to be great. The site is called SoundSnap and as far as I can tell, it offers royalty free sounds effects for commercial use. To make sure I 'make it mine' I never use a raw sound from their site. I always mix each effect with at least one other sound I get from there, or from some other free site. Because it is 'user-driven' it's sometimes difficult getting a specific effect, but it often has lots of effects for most things, and they're all free. I do find that SoundSnap usually has high quality sounds and can be great in a game once you massage them a little. For the sound massaging, I like to use GoldWave. I actually did buy a license for only 45 dollars which I felt has definitely been worth it. The demo version of the program offers most of the functionality if you're interested. The program itself has many mixing features and is fast and simple to use. To round out this media post, I actually used Windows Movie Maker to create the first trailer of the game. Wikipedia tells me it's been bundled since Windows Me (so you probably own it) but I've never needed it until now. I've found it fairly powerful and easy to use. Since it's free and did the job well enough, I'm sticking with it for now--and the new gameplay trailer which will be available next week! Flocking is the sort of programming that you can lose days experimenting with the subtleties. Some of you old-timers may remember Stanley and Stella video from back in the 80's. Craig Reynold's "boids" taught me my original programming understanding of flocking. Since learning about it, I've programmed flocking systems several times (all for fun) and was excited to come up with an enemy to use it in Weapon of Choice. The creature in the game is called the Darting Flock. In the prototype, the center (shown as a white rectangle) is the controlling element. The green fliers try to guard it. 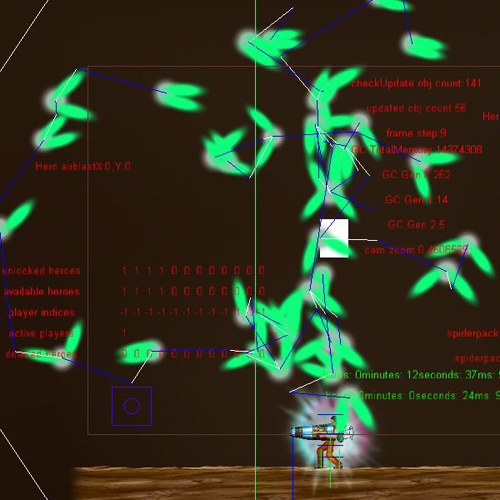 As the player shoots their way through the flock, the controller creates more fliers that encircle it. Some even dive-bomb you. The fun is trying to cut a hole through the flock and shoot the center while dodging incoming fliers. Originally I tried simply having the fliers steer around the controller, and constantly home in on its center with an acceleration, sort of like the Earth being slung around the Sun. While the behavior looks decent in the video, it feels a little chaotic (which can be exciting) but generally primitive. I decided to try out a flocking algorithm to spice up the action. As described by the "boids" system, flocking works by having many objects follow a small set of steering rules. I've simplified the system more but also added some changes to it to keep it interesting. The new actions are: 1. Find the closest neighbor. 2. Follow a target position offset behind the neighbor by a random angle. 3. Recheck for the closest neighbor every few seconds. The exceptions are a few 'leader fliers' which need to know where the flock is going. They are forced to follow the controller at a certain distance, while all other fliers connect from there. When the leaders follow the controller, they are actually following a position just outside the controller that orbits the controller itself. This indirection gives even more motion to the group. The blue lines in the image are between the flier and their target. The white lines are from the flier that is getting followed by another flier. You can trace the chain of fliers as they follow each other to see the order. Flocking can be more expensive than homing from a processing standpoint since every flier has to check the distance to every other flier. By staggering and delaying how often this happens we can ease the burden on the processor. Several neat behaviors come from this. The fliers may fly outwards suddenly but will eventually come back around, usually in a wild spiral. When the player kills fliers, for a few seconds some of them will follow their dead friends down before reacquiring a new neighbor! 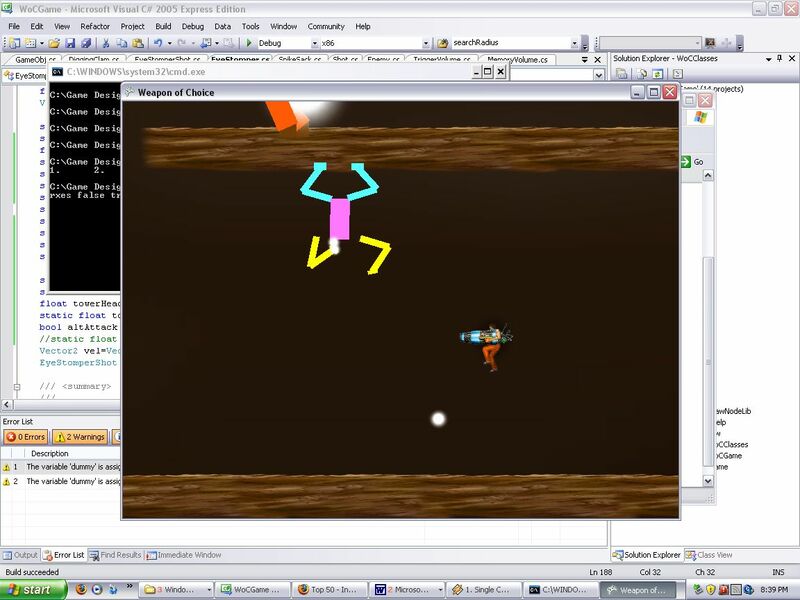 This makes the fight a lot more exciting and can create some really intelligent looking emergent behavior from relatively simple programming. With the DBP contest over it's time to get back to core development. That means finishing the game on time! There are a number of new levels blocked out and I've separated them into two groups. One group is to be finished by November 1st, the second group is additional levels to be finished mid-way through November. Why would we have two finish dates? Because unfortunately Microsoft hasn't released exactly when Xbox Live Community Games will be launched and we want to be ready for launch. From various internet rumors, it seems likely it will be some time in November, but we're not certain when. Originally I was planning on the game releasing in December, but having the potential release date of the game pushed closer in time does wonders for figuring out design priorities. It was clear what levels we should include in order to finish by November 1st. Originally there were over 40 levels outlined (I was completely delusional at the time) and close to 60 monsters from small to gigantic. There will be more like 9-12 levels in the game, but these will definitely be the most action-packed and distinct levels from those originally envisioned. Recently, I've somehow managed to convince Jack Mayer to help design some of the levels. Jack brings many years experience with him along with Xbox 1 development time! In order to make the most efficient use of two people (myself and Jack), we decided early on to rapidly prototype the enemies and the new levels. Jack is roughing in the level as I am prototyping the enemies. The rough art consists of building a skeleton for an enemy, and just using colored blocks on the bones. I do animate them but in a much less detailed manner. The programming for the enemy is created, but again not near to the same quality the final version will reach. The amount of polish for the prototype itself is a balancing act. The more polished you make it the more problems you may uncover early, but the more work it takes away from the final pass on the enemy or level. The benefit of all this early work is now the level designer can get the gameplay (enemies, hazards, vehicles) in place, more accurate, and more fun than without using prototypes and just jumping straight to polished assets. In addition we can find level art needs previously unknown, new enemy art needs, and generally new ideas can be figured out early on, rather than trying to shoehorn them into the finished assets. 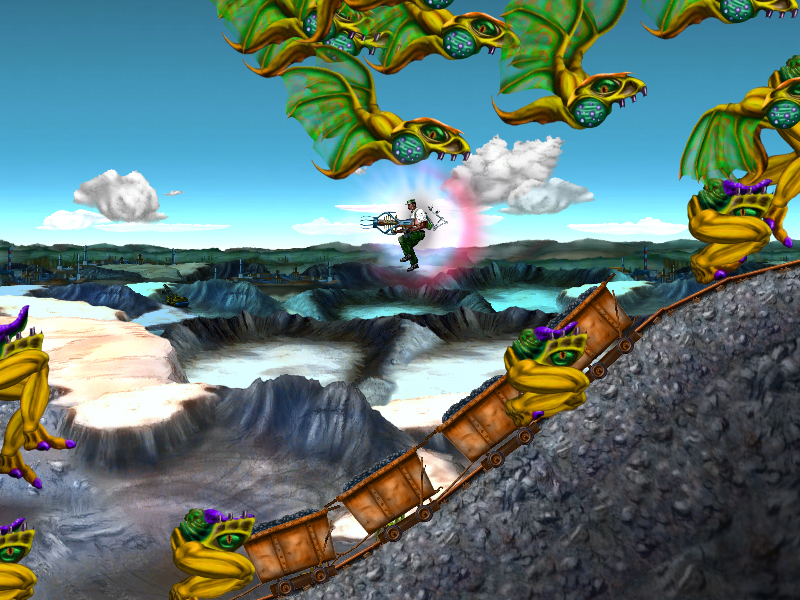 For the current level and enemies prototypes we identified the need for: new hazards on a climbable enemy, new attack abilities to balance an enemy's attacks better, and new environmental hazards to be used throughout the level to vary level pacing. Without this early work we either would have never made these improvements, or we would have wanted to make them but at the cost of much more rework down the road.